Produktinformationen "Minjung's Essence Korean-English Dictionary"
Minjungseorim's Essence edition stands for a family of comprehensive dictionaries presented in a functional format. This dictionary has more than 150.000 main entries and 36.000 idiomatic expressions and comes in a robust cardboard case. Please note that the Korean entries are not romanized. 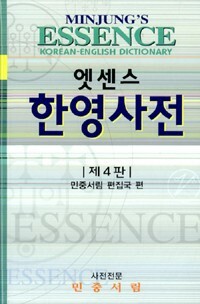 Weiterführende Links zu "Minjung's Essence Korean-English Dictionary"
Unser Kommentar zu "Minjung's Essence Korean-English Dictionary"
Kundenbewertungen für "Minjung's Essence Korean-English Dictionary"